The UAE is a country that is popular for its thrilling and adventurous entertainment places all over the world. It is also famous for having number of World’s finest and the most splendid structures existing around the Globe. UAE Water and Theme parks are perfect combination of magnificent structures and thrilling entertainment package. If you are exploring Dubai This article will provide you complete and latest information, to help local and foreign tourists, who are about to know and research about such exciting and adventurous places, available in this country. Wild Wadi Water & Theme park is an amazing park that is built on the concept of Arab Folk tale of Juha. The park, which is positioned in Dubai – near to The Burj Al Arab, comprises of 30 versatile attractions and rides. This park opens at 10 AM and closes at 10 in the evening. This place doesn’t just satisfy adventurous single adult but accommodates the needs and fun facilities for families, babies/toddlers and special people. Entry ticket of this park is AED 295 for adults and AED 250 for a child. The must thing to do in Wild Wadi Water and Theme park is BurjSurj, JumeriahSceireh, Surfing, Juha’s Journey and Flood River. If you truly want to experience some thrilling and adventurous moments then definitely you need to head towards Wadi Adventures. This place is located at Al-Alin. Interesting fact about this place is that this water park is the first ever park in Middle East that provides electrifying rides and activities to do such as water Rafting, Surfing, Kayaking, Zim line to take a course. Even a beginner can have fun loaded time here safely. And of course lots of sensational activities can be performed by pro thrillers. Timing of Wadi adventure starts from 11AM and closes at 8 in the evening. The entry charges for adults are AED 100 and for a child it’s AED 50. Aquaventure is an amazing and magnificent water park available in UAE and apple of the eye foranyone who has at least visited this park once. This park is located at the Atlantis Resort on the luxurious The Palm Jumeirah Island, Dubai. This place is considered a heaven for thrill seekers as it has a remarkably fantastic river that is 2.3 kilometers wideand has truly sensational Water slides. Other must experience things to do are its electrifying rides, a visit to The Tower of Poseidon and The Tower of Neptune. If you have ever been to Abu Dhabi, then you certainly will be well aware of Yas Island. Yas World is famous and amazing Park that deals with lots of amusements,rides and water slides which be counted in numbers to 45. The two rides of this park surpass the rest, these include, Bubble’s Barrel, World’s largest sheet that pumps 7000+ liters of water/second and Dawwama ride, a Hydro Magnetic Tornado Ride i-e 20m high funnel. The inspirations behind this hi-fi water park is ‘The Legend of the Lost Pearl’, which you can witness right from the moment when you enter this place. Its décor and creative structures are simply outstanding. Another stuff that must be done here include Shaheen’s Adrenaline Rush & Dhabi’s Exciting Adventure. The park timing varies from season to season. According to accessibility, tickets are segregated into 3 categories. That is Bronze, Silver, and Gold. Select the type of ticket according to your purchasing power. Another really generous stance of this park management is that they allow Nannies and toddlers to enter here for free. Ski Dubai is the only indoor Snow Park in the World that is Huge in size and miraculous. This park is one of a kind that covers around 3000 sq meters of snow. Its beauty in white leaves you breathless. This resort is located on the Sheikh Zayed Road of Dubai. Ski Dubai is one of the extremely interesting places of Dubai. Ski Dubai floor is fully covered with real snow that has up to 85 meter high hill. This hill like structureis divided into 5 ski slopes that differ in steepness and level of difficulty, fromexpert to newbie. Main attraction and amusement of this place includes Ski Slopes, The Snow Park and Subzero Zip line.This place is open for visitors from 10 am to 12 pm. This place has enough space to accommodate 1500 guests at a time easily. Entry ticket costs AED 285 and if you are a resident of UAE you can avail 20 percent discount. 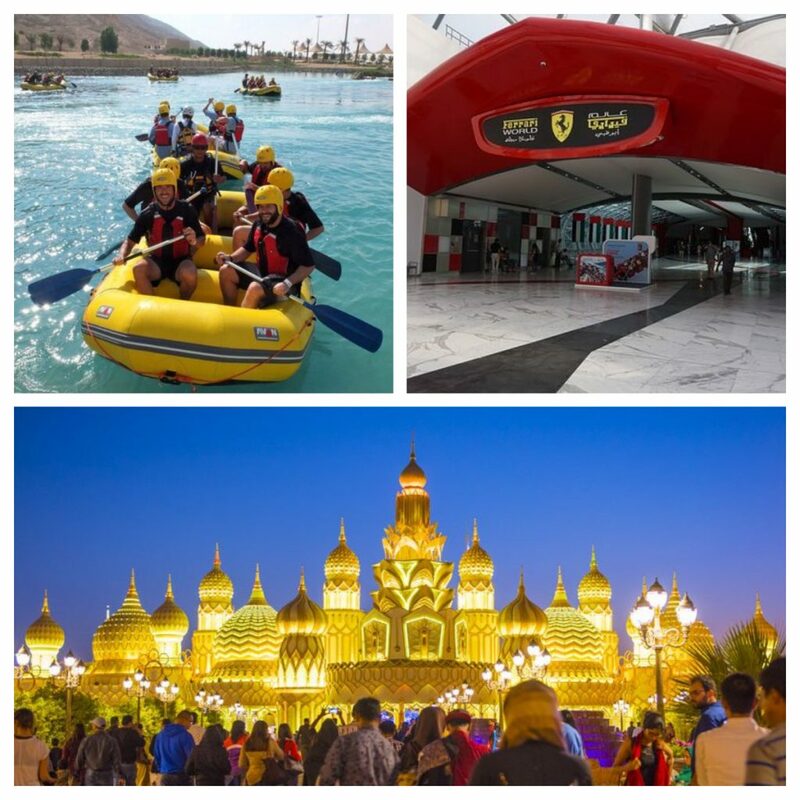 Ferrari World is a new and top of the linethemeparks located in YAS Island. This place is themed and inspired from The Ferrari. This theme park has 22 thrilling rides for amusements and entertainment, in which they hold 3 diverse live shows. Formula Rosa and Fiorano GT challenge is visitors’ favorite. For adults AED 275 is the ticket price whereas for juniors its AED 22. Hill Fun Park is the first ever themed park constructed in Gulf. This park is located in the Al Hili area of Dubai. With an intention to preserve and groom the environment survival of the park, management has planted more than 250 palm trees as well as around 30,000 other environment friendly plants. Top attractions of this place are the Sky Flyer and Ice Rink. Dubai Parks and Resorts comprise5diverse theme parks. Name of those theme parks are Lego Land, Bollywood Park, LEGOLAND Water Park, the MotionGate Park, River Land. Famous attractions and amusements include Smurf’s village for fun, Sony Pictures for action, Dream Works, Studio Central and Lions Gate, Bollywood Boulevard, French Village, The Peninsula and the Indian Gate, Mumbai Chow and the Dragon. IMG world is going to be the world‘s largest and most amazing indoor theme park that will be residing on Sheikh Muhammad Bin Zayed Road, next to Global Village. This is the actual place where the world’s famous and everyone’s favorite cartoon characters from Cartoon Network, Marvels and The Lost Valley Dinosaur Adventure have been created. This park will have 17 astounding themed rides.